As I said above, the Korean brand May Coop is really new to me and until it was featured in ‘Get it Beauty’. I had never heard from that brand before. It seems it is a more high end brand according to the very beautiful packaging and the materials used. It also seems that they are focusing on natural ingredients. 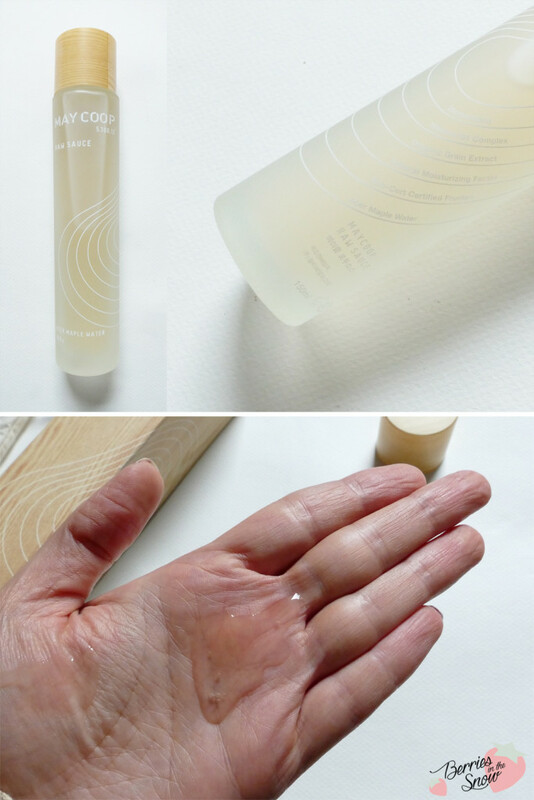 The May Coop Raw Sauce is a multifunctional essence that combines the effects of a toner, an essence and a emulsion/lotion in one. Unlike most cosmetic items that are made of water, this one contains acer maple water instead. It is quite a trend in Korea right now to use products containing other liquids as replacement for water. The description of the product packaging says acer maple water, but the translation of the ingredient list says maple sap. I think they mean the maple xylem sap, because 93 % maple sap/ syrup would be super sticky and sugary. You can find the ingredients on COSDNA. Apart from a whole bunch of plant ingredients it sadly contains alcohol. So if you have sensitive skin be aware of this point. On the other hand, the main ingredient here is maple tree sap, which makes 93 % of the total volume. All the other ingredients fall into the remaining 7 %. 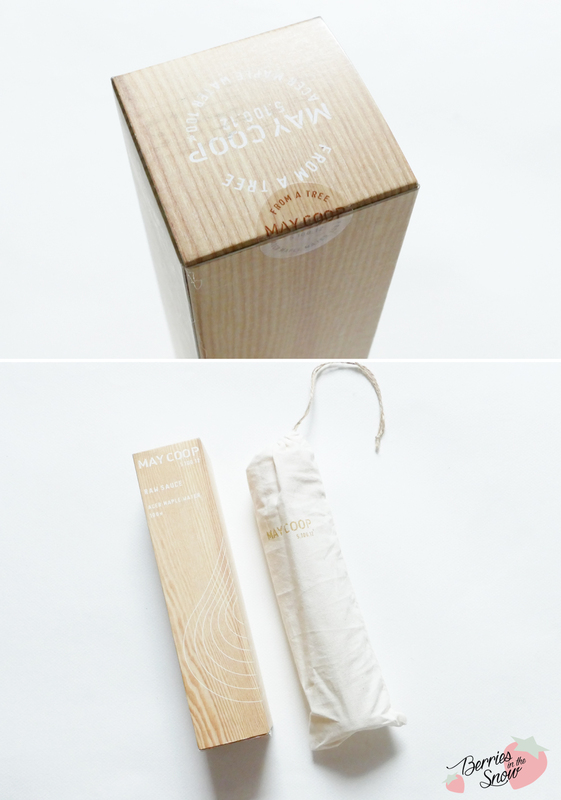 The design of the cardboard box of the May Coop Raw Sauce is like a wooden box. It has the key points of the essence listed on one side, shaped like wooden rings. The features of this multipurpose essence are: Humectant, Nature 701 Complex, Organic Grain extracts, Natural Moisturizing Factor, Eco-cert Certified Fructan, and Acer Maple Water. Maple xylem sap is mainly a watery solution of hormones, mineral elements and other nutrients of the plant. The maple xylem sap is a very effective moisturizer as its rich in glycerin and reinforces skin’s immunity. The similarity to the water molecule size of the skin allows the maple xylem sap to penetrate deaper into the skin than regular water. Another key ingredient seems to be the skin-nourishing fructan powder (eco-cert certified), which is supposed to strengthen the skin. The May Coop Raw Sauce comes in a 150 ml frosted glass bottle. The cap is from plastic, but has the same wooden pattern as the cardboard box. The bottle comes separately packed in a canvas, which gives it another high-quality touch. the regular drop dispensing opening of the bottle is sealed by a plastic in order to prevent leaking. The glass has the same description in wooden rings like the cardboard packaging. According to the official site May Coop Raw Sauce fulfills these three points: intensive moist supply, intensive nutrition supply, constantly strengthening. The May Coop Raw Sauce is a watery liquid (a tiny bit thicker than water though), which has a light yellow color. It has a fragrant smell to it, which is stronger than most of the other toner/essences I use atm, but the scent is nice and doesn’t linger long. Apart from that, the May Coop Raw Sauce feels moisturizing, and is not sticky after absorption. although it contains some alcohol it doesn’t feel drying (probably since the amount is not much). Although quite moist and labeled as multi-function product I still use many other products in combination and I do not skip my usual moisturizer. I’ve only used this for 2 weeks so far, so I cannot make any remarks about long-term effects like strengthening, but I think it fits nicely into my skincare routine, doesn’t give me any breakouts and feels like an extra hydration boost for my face. 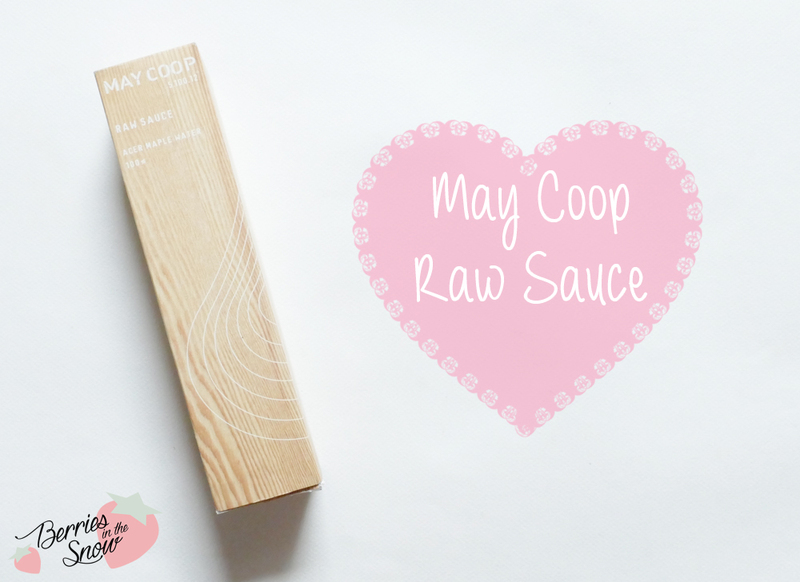 I enjoyed trying the May Coop Raw Sauce very much and I’m happy it found a place in my skincare routine. I yet don’t know if I will repurchase it again and if it will replace any of my other steps in future, but it will be used up to the end for sure. 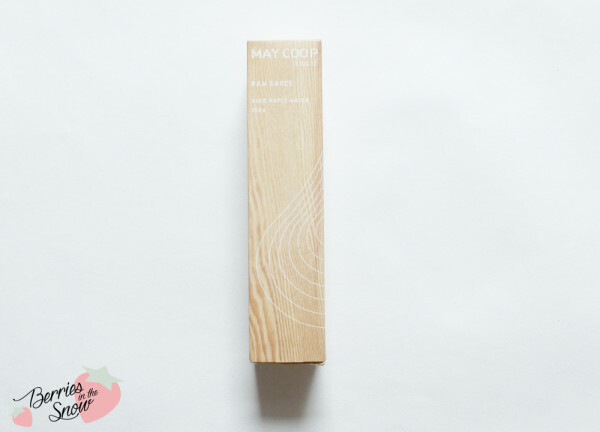 The May Coop Raw Sauce is available at Peach and Lily for 42.00 US$ or at Koreadepart for 38.27 US$. From the official May Coop page you’ll find it listed for 36000 Won. Although it is a multi-purpose product it is more on the expensive side. On the other hand, the detailed packaging and material makes up for the price. Also the volume is more than enough to last for a long time, since not much product is needed. So probably, it will take some time before I’ve used up this precious product. I love the design of this one. ‘Raw sauce’ and ‘maple sap’ sound like the product is going to be super sticky! I’m glad it is not. 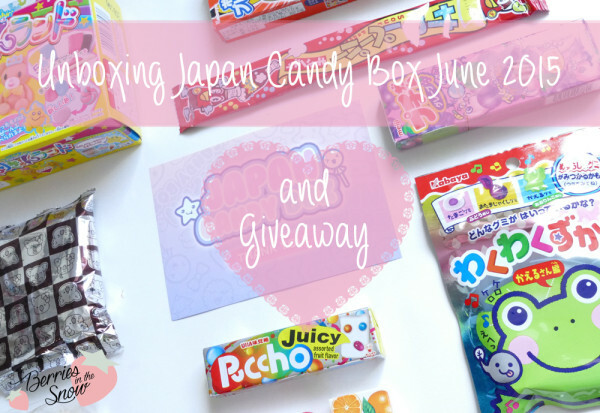 I must say the packaging is so pretty and the name so intriguing it makes me want to try it! This sounds lovely! 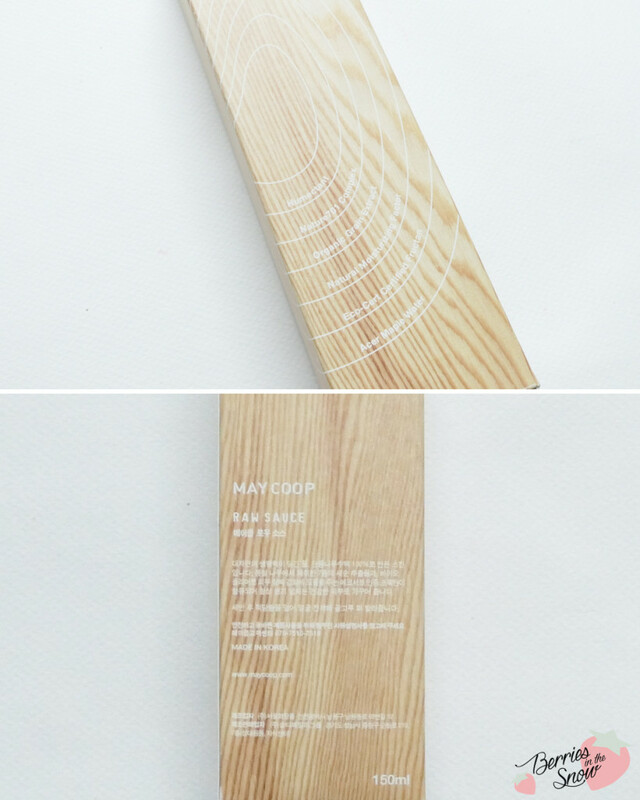 I like the MayCoop cleanser that BNT sent me too! I have been using Raw Sauce for last 4 weeks. I have seen 0 difference in my skin. I have dry skin and as winter is already here (in MN), my skin doesnt feel any hydrated that it used to; It might be the alcohol effect. I personally think, this sauce is has been a waste of time and money. I am just glad that Sephora will let me return this product for full refund. Oh, what a shame it didn’t work for you! I still like it and I use it in turns with my other essences. I really am amazed that you will get the refund from Sephora! This is really nice of them. Probably it would not have been possible here.